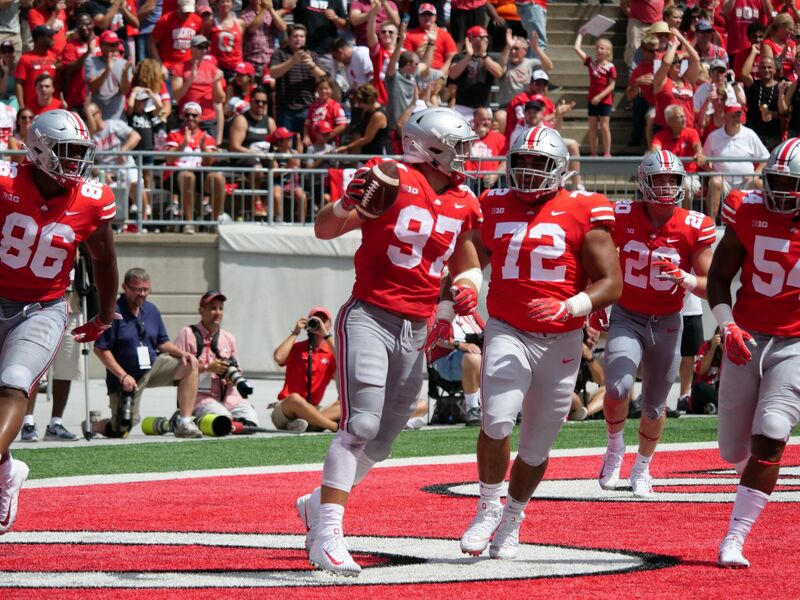 COLUMBUS, Ohio-Dwayne Haskins Jr., threw for 313 yards and five TDs to lead Ohio State (1-0) to a 77-31 win over visiting Oregon State University (0-1) Saturday at Ohio Stadium. The win was the first for acting Ohio State head coach Ryan Day. 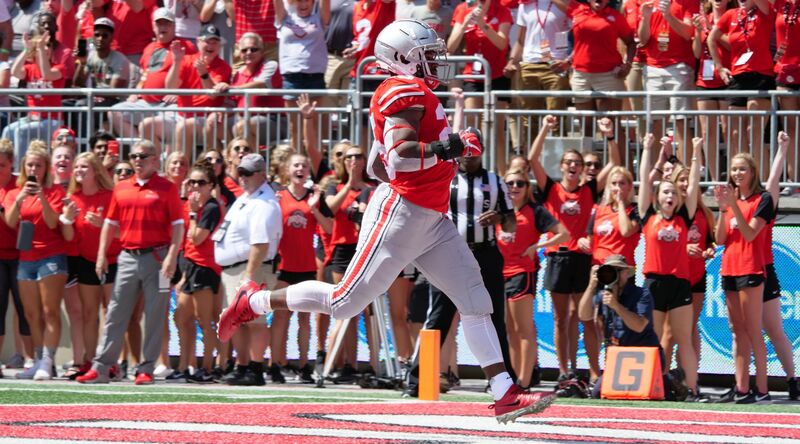 Mike Weber Jr. complimented Haskins’ efforts with a career-high 186 rushing yards to go with three scores. He also had a receiving touchdown for a career-high four touchdowns in the game. 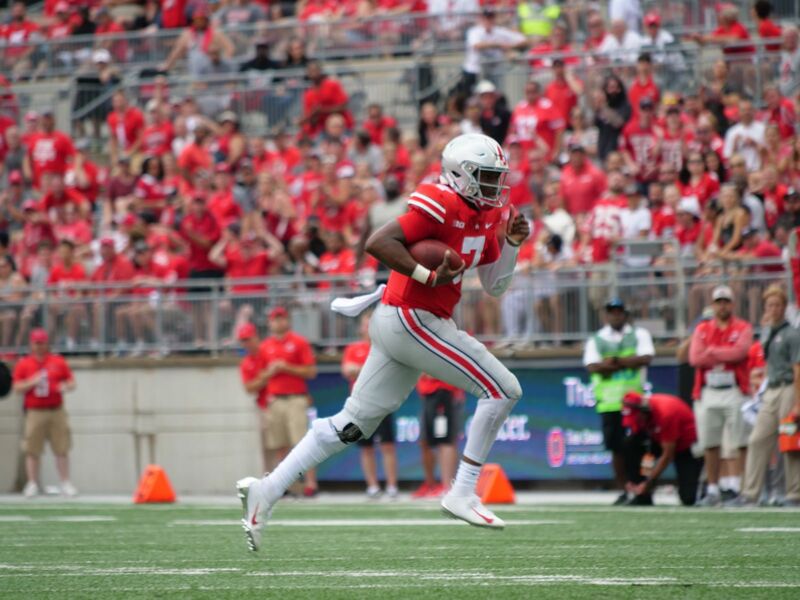 Haskins became the first Ohio State quarterback to toss five touchdown passes and throw for more than 300 yards in a first career start. He completed 22 of 30 pass attempts in the game. The Buckeyes totaled 721 yards of total offense with a balanced 346 yards through the air and 375 on the ground. It was the second-most yards of total offense in program history, behind only the 776 vs. Bowling Green in the 2016 season opener. 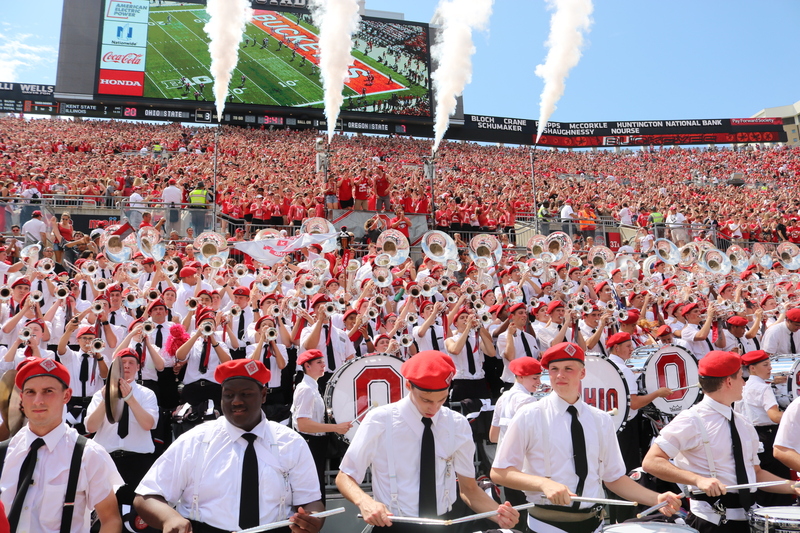 Ohio State is back in action at home Sept. 8 vs. Rutgers. The Big Ten Conference opener is slated for a 3:30 p.m. kickoff and will be televised on Big Ten Network. Nick Bosa recovered an Oregon State fumble on the Beavers first possession with 12:30 left in the first quarter on Ohio State’s 43 yard line. 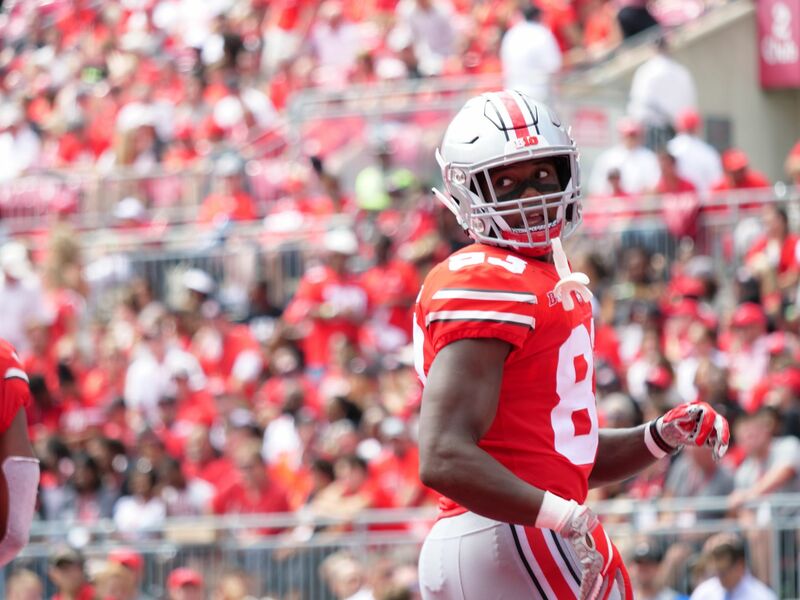 The Buckeyes then covered 57 yards on five plays and scored on a Dwayne Haskins Jr. 2-yard touchdown pass to Terry McLaurin with 11:17 to play. Oregon State evened the score at 7-all on a 75-yard scoring pass from Connor Blount to Trevon Bradford with 10:35 on the clock. The drive covered 75 yards on three plays over 42 seconds. Mike Weber Jr. then scored on a 16-yard scamper to end an eight-play, 65-yard drive to put the Buckeyes up 14-7 with 8:20 remaining. Ohio State’s Dre’mont Jones sacked Blount for a loss of 10 yards that led to an Oregon State punt a play later. 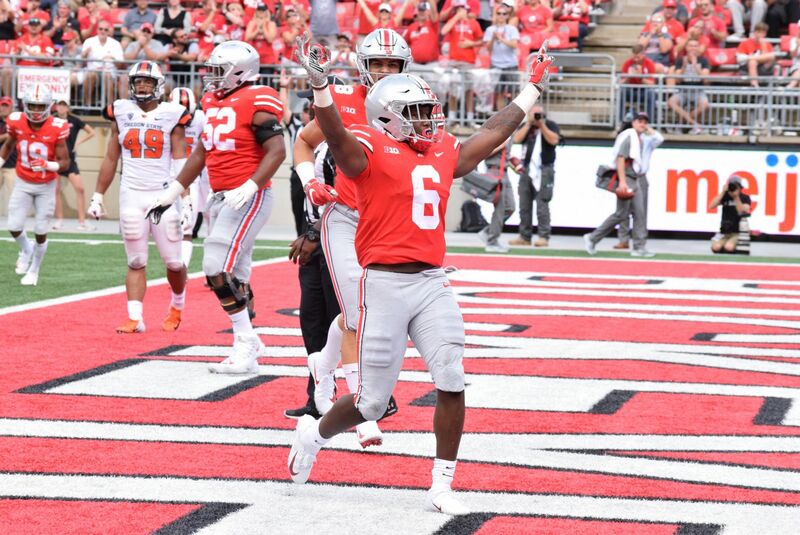 The Buckeyes, aided by an Oregon State interference call on the punt return, went 75 yards over the next eight plays to take a 21-7 lead after a Haskins to Rashod Berry 6-yard touchdown pass. Bosa recorded a sack with under a minute to play in the quarter for a loss of 12, forcing an Oregon State punt. 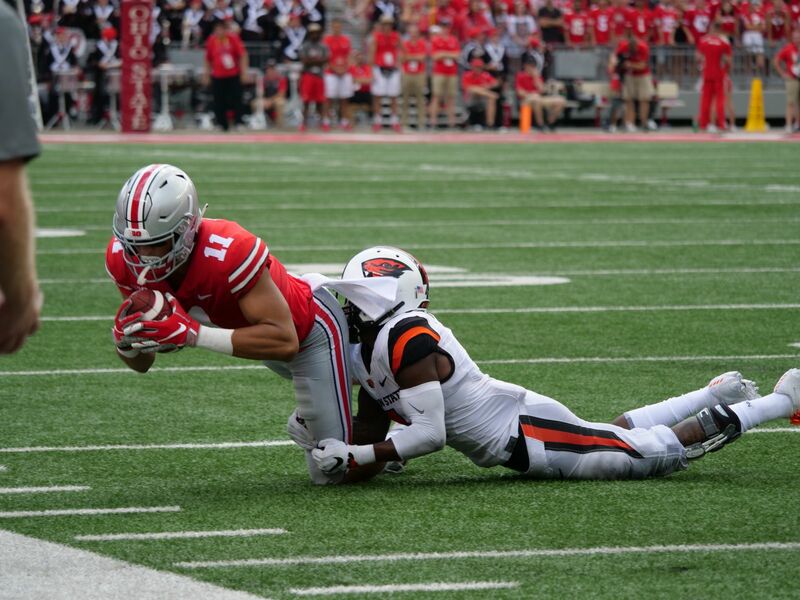 The Buckeyes fumbled the punt and it was recovered by the Beavers at the Ohio State 24. The Ohio State defense recorded a tackle for loss of 5 yards to the Ohio State 29 to end the quarter. 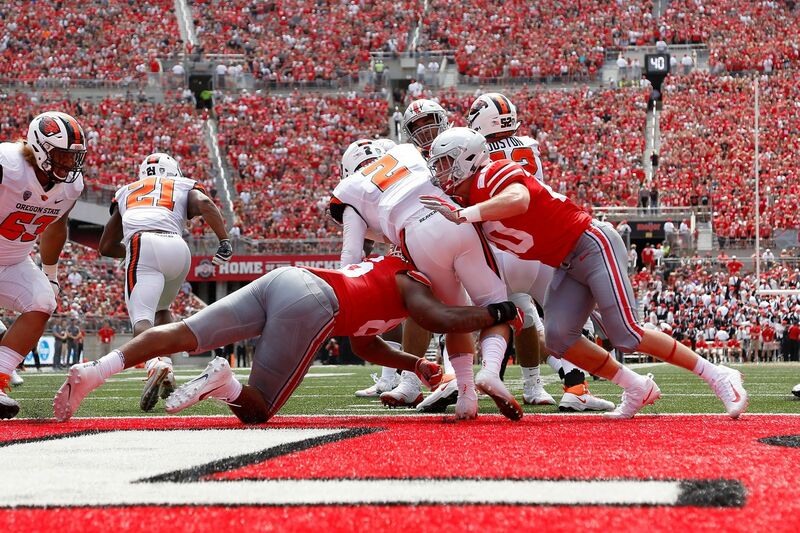 The Beavers failed to score after Ohio State’s fumbled punt, missing a 43-yard field goal attempt with 14:21 showing on the second quarter game clock. Weber put the Buckeyes up 28-7 after a 49-yard touchdown run on Ohio State’s next possession to cap a six-play, 75-yard scoring drive that ate up 1:56 of game clock. Weber crossed the goal line with 12:25 left in the first half. The Ohio State defense forced the Beavers to punt on their next possession. 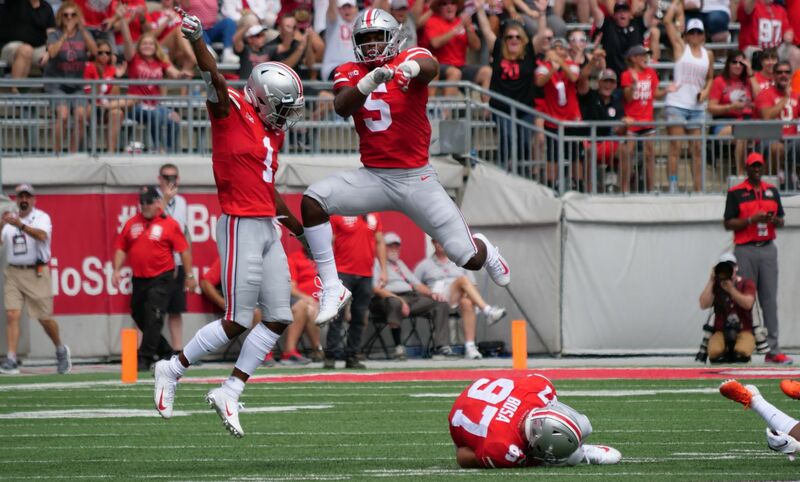 Ohio State went ahead 35-7 when the Buckeyes covered 59 yards in 10 plays, ending with a 3-yard touchdown pass from Haskins to Weber. Another three-and-out followed for the Beavers. 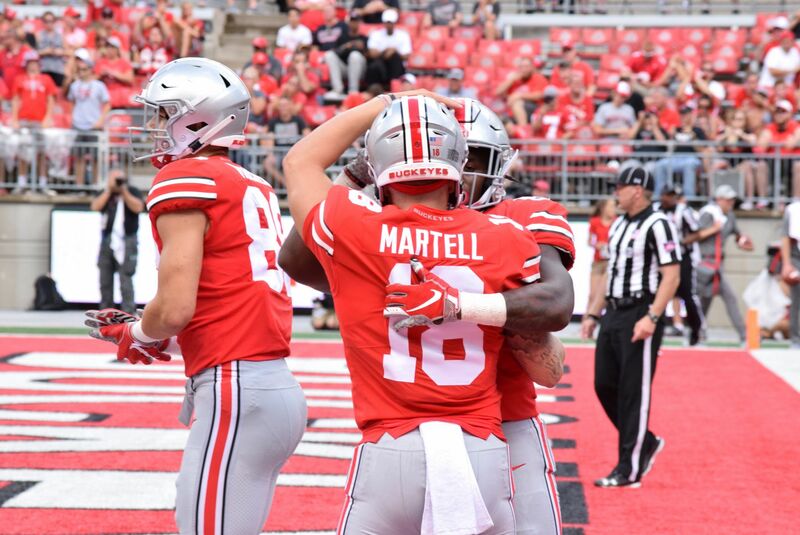 Tate Martell came in at quarterback and after an incomplete on his first attempt, converted a 5-yard pass to Chris Olave for his first completion as a Buckeye. 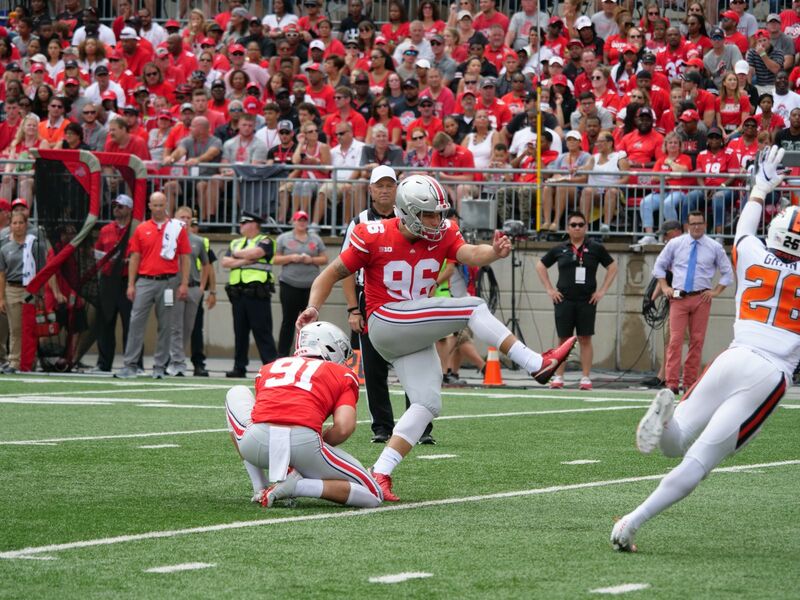 The Buckeyes downed the ensuing punt on the 6. On the drive, linebacker Pete Werner sacked Blount and forced a fumble. It was recovered by Nick Bosa in the endzone for a touchdown and 42-7 Ohio State lead after the extra point. Oregon State found the endzone for the second time in the game with 19 seconds left in the half on another Blount to Bradford scoring strike, this time for 7 yards making the score 42-14 at the end of two quarters. 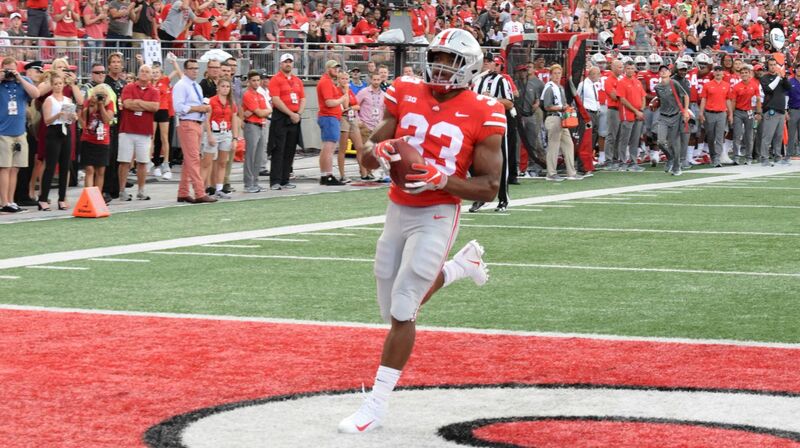 After a weather delay of more than an hour, Ohio State opened the second half with the ball and promptly scored on a 75-yard touchdown pass from Haskins to McLaurin with 14:45 left in the third. Oregon State answered quickly with an 80-yard run by Artavis Pierce to make it 49-21 Buckeyes with just 34 seconds off the third-quarter game clock. 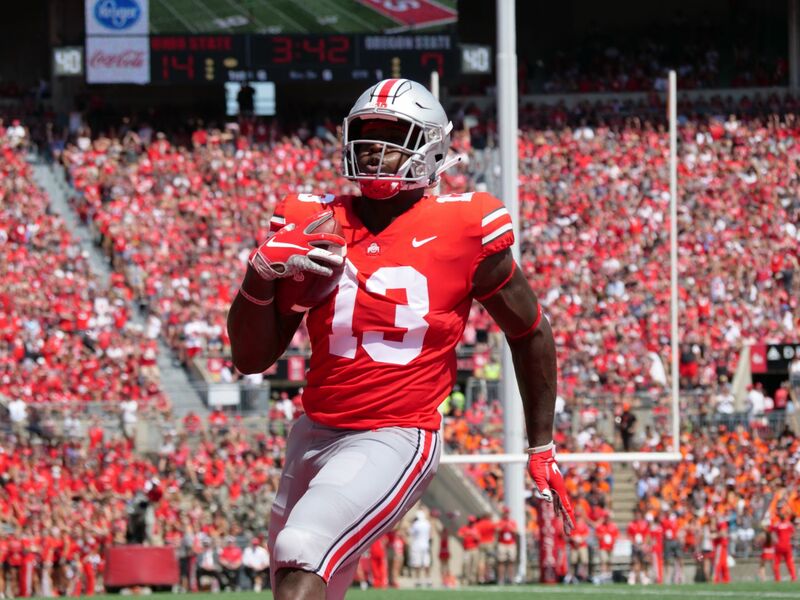 Parris Campbell scored on an 8-yard pass play from Haskins to give Ohio State a 56-21 lead after a 10-play, 75-yard scoring drive that ended with 11:55 left in the third. Haskins has tossed five TD passes in the game, converting 22 of 30 throws for 313 yards after three quarters. After Ohio State kicked off, the Beavers scored two plays later on a 76-yard TD run by Pierce to draw Oregon State to within 56-28 with just over 11 minutes remaining in the third quarter. 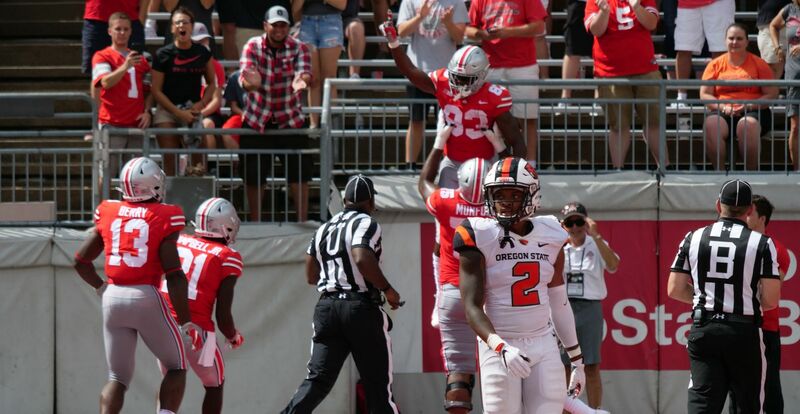 After an Oregon State interception at the Beavers’ 2 yard line and a return to the Ohio State 19, Oregon State stalled at the Ohio State 5-yard line before converting on a 23-yard field goal to make it 56-31 Ohio State with 5:25 to play in the third quarter. 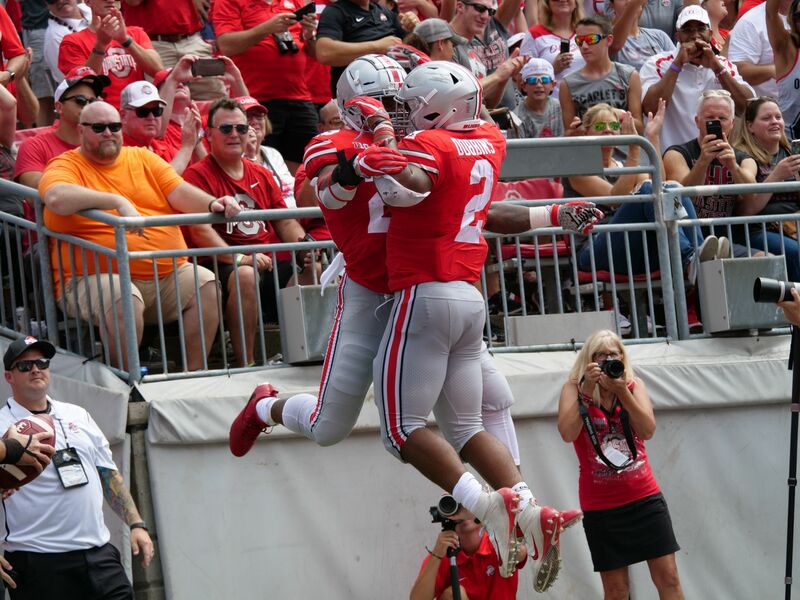 Ohio State scored three rushing touchdowns to extend the lead to 77-31 in the final quarter. Weber converted a 4-yard run just 35 seconds into the quarter, Brian Snead scored on a two-yard carry with 9:26 left and with 3:50 remaining Master Teague found the endzone on a 33-yard rush. The Buckeye defense held the Beavers to three-and-out on their first two drives of the quarter.